95% of patients with pancreatic cancer die within 5 years of diagnosis. Surgical resection is currently the only treatment option, but only 20% of patients qualify for this surgery. Neoadjuvant chemotherapy can enable patients with borderline resectable tumors to qualify for surgery, but features of the tumor microenvironment (tissue pressure, stromal density, and hyaluronic acid) can reduce its effectiveness. Targeted therapy can mitigate these issues; therefore, the goal of this project is to develop novel surrogate imaging biomarkers for monitoring the effectiveness of neoadjuvant therapies. 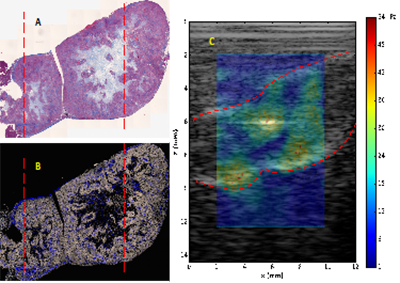 We use novel imaging techniques to characterize the tumor microenvironment. Nanoparticle uptake in tumors is mediated by the interplay of vascular and collagen density with interstitial pressure. Interstitial fluid pressure in soft tissue as a result of an externally applied contact pressure.